The Roman Senate (Latin : Senātus Rōmānus) was a political institution in ancient Rome. It was one of the most enduring institutions in Roman history, being established in the first days of the city of Rome, (traditionally founded in 753 BC). It survived the overthrow of the kings in 509 BC, the fall of the Roman Republic in the 1st century BC, the division of the Roman Empire in 395 AD, the fall of the Western Roman Empire in 476 AD, and the barbarian rule of Rome in the 5th, 6th, and 7th centuries. 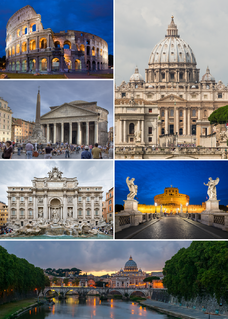 The Roman Kingdom, also referred to as the Roman monarchy, or the regal period of ancient Rome, was the earliest period of Roman history, when the city and its territory were ruled by kings. The King of Rome was the chief magistrate of the Roman Kingdom. According to legend, the first king of Rome was Romulus, who founded the city in 753 BC upon the Palatine Hill. Seven legendary kings are said to have ruled Rome until 509 BC, when the last king was overthrown. These kings ruled for an average of 35 years. Lucius Tarquinius Superbus was the legendary seventh and final King of Rome, reigning from 535 BC until the popular uprising in 509 that led to the establishment of the Roman Republic. He is commonly known as Tarquin the Proud, from his cognomen Superbus. The Principate or early Roman Empire is the name sometimes given to the first period of the Roman Empire from the beginning of the reign of Augustus in 27 BC to the end of the Crisis of the Third Century in 284 AD, after which it evolved into the so-called Dominate. Representation of a sitting of the Roman senate: Cicero attacks Catiline, from a 19th-century fresco in Palazzo Madama, Rome, house of the Italian Senate. It is worth noting that idealistic medieval and subsequent artistic depictions of the Senate in session are almost uniformly inaccurate. Illustrations commonly show the senators arranged in a semicircle around an open space where orators were deemed to stand; in reality the structure of the existing Curia Julia building, which dates in its current form from the Emperor Diocletian, shows that the senators sat in straight and parallel lines on either side of the interior of the building. In current media depictions in film this is shown correctly in The Fall of the Roman Empire , and incorrectly in, for example, Spartacus . While senate meetings could take place either inside or outside the formal boundary of the city (the pomerium ), no meeting could take place more than a mile outside it. The senate operated while under various religious restrictions. For example, before any meeting could begin, a sacrifice to the gods was made, and a search for divine omens (the auspices ) was taken. The senate was only allowed to assemble in places dedicated to the gods. With a dictator as well as a senate, the senate could veto any of the dictator's decisions. At any point before a motion passed, the proposed motion could be vetoed, usually by a tribune. If there were no veto, and the matter were of minor importance, it could be put to either a voice vote or a show of hands. If there were no veto and no obvious majority, and the matter were of a significant nature, there was usually a physical division of the house,  with senators voting by taking a place on either side of the chamber. During the early Roman Empire, all judicial powers that had been held by the Roman assemblies were also transferred to the senate. For example, the senate now held jurisdiction over criminal trials. In these cases, a consul presided, the senators constituted the jury, and the verdict was handed down in the form of a decree (senatus consultum),   and, while a verdict could not be appealed, the emperor could pardon a convicted individual through a veto. The emperor Tiberius transferred all electoral powers from the assemblies to the senate,  and, while theoretically the senate elected new magistrates, the approval of the emperor was always needed before an election could be finalized. The Senate of the Roman Republic was a political institution in the ancient Roman Republic. It was not an elected body, but one whose members were appointed by the consuls, and later by the censors. 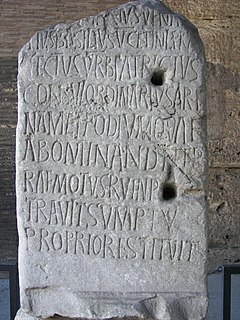 After a Roman magistrate served his term in office, it usually was followed with automatic appointment to the Senate. According to the Greek historian Polybius, our principal source on the Constitution of the Roman Republic, the Roman Senate was the predominant branch of government. Polybius noted that it was the consuls who led the armies and the civil government in Rome, and it was the Roman assemblies which had the ultimate authority over elections, legislation, and criminal trials. However, since the Senate controlled money, administration, and the details of foreign policy, it had the most control over day-to-day life. The power and authority of the Senate derived from precedent, the high caliber and prestige of the senators, and the Senate's unbroken lineage, which dated back to the founding of the Republic in 509 BC. It developed from the Senate of the Roman Kingdom, and became the Senate of the Roman Empire. The legislative assemblies of the Roman Republic were political institutions in the ancient Roman Republic. According to the contemporary historian Polybius, it was the people who had the final say regarding the election of magistrates, the enactment of Roman laws, the carrying out of capital punishment, the declaration of war and peace, and the creation of alliances. Under the Constitution of the Roman Republic, the people held the ultimate source of sovereignty. 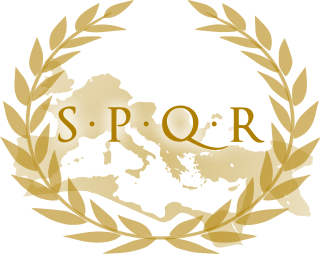 Senatus consultum ultimum, more properly senatus consultum de re publica defendenda is the modern term given to a decree of the Roman Senate during the late Roman Republic passed in times of emergency. The form was usually consules darent operam ne quid detrimenti res publica caperet or videant consules ne quid res publica detrimenti capiat. It was first officially decreed prior to the fall of Gaius Gracchus in 121 BC, and subsequently at several other points, including during Lepidus' march on Rome in 77 BC, the Conspiracy of Catiline in 63 BC, and before Julius Caesar crossed the Rubicon in 49 BC. The senatus consultum ultimum effectively replaced the disused dictatorship, by removing limitations on the magistrates' powers to preserve the state. After the rise of the Principate, there was little need for the Senate to issue the decree again. The Concilium Plebis was the principal assembly of the ancient Roman Republic. It functioned as a legislative assembly, through which the plebeians (commoners) could pass laws, elect magistrates, and try judicial cases. The Plebeian Council was originally organized on the basis of the Curia. Thus, it was originally a "Plebeian Curiate Assembly". The Plebeian Council usually met in the well of the comitium and could only be convoked by the Tribune of the Plebs. The assembly elected the Tribunes of the Plebs and the plebeian aediles, and only the plebeians were allowed to vote. The Roman Constitution was an uncodified set of guidelines and principles passed down mainly through precedent. The Roman constitution was not formal or even official, largely unwritten and constantly evolving. Having those characteristics, it was therefore more like the British and United States common law system than a sovereign law system like the English Constitutions of Clarendon and Great Charter or the United States Constitution, even though the constitution's evolution through the years was often directed by passage of new laws and repeal of older ones. The Roman Assemblies were institutions in ancient Rome. They functioned as the machinery of the Roman legislative branch, and thus passed all legislation. Since the assemblies operated on the basis of direct democracy, ordinary citizens, and not elected representatives, would cast all ballots. The assemblies were subject to strong checks on their power by the executive branch and by the Roman Senate. Laws were passed by Curia, Tribes, and Centuries. The Constitution of the Roman Empire was an unwritten set of guidelines and principles passed down mainly through precedent. After the fall of the Roman Republic, the constitutional balance of power shifted from the Roman Senate to the Roman Emperor. Beginning with the first emperor, Augustus, the emperor and the senate were theoretically two co-equal branches of government. In practice, however, the actual authority of the imperial Senate was negligible, as the emperor held the true power of the state. During the reign of the second emperor, Tiberius, many of the powers that had been held by the Roman assemblies were transferred to the Senate. The Constitution of the Roman Kingdom was an unwritten set of guidelines and principles originating mainly through precedent. During the years of the Roman Kingdom, the constitutional arrangement was centered on the king, who had the power to appoint assistants, and delegate to them their specific powers. The Roman Senate, which was dominated by the aristocracy, served as the advisory council to the king. Often, the king asked the Senate to vote on various matters, but he was free to ignore any advice they gave him. The king could also request a vote on various matters by the popular assembly, which he was also free to ignore. The popular assembly functioned as a vehicle through which the People of Rome could express their opinions. In it, the people were organized according to their respective curiae. However, the popular assembly did have other functions. For example, it was a forum used by citizens to hear announcements. It could also serve as a trial court for both civil and criminal matters. The Senate of the Roman Kingdom was a political institution in the ancient Roman Kingdom. The word senate derives from the Latin word senex, which means "old man". Therefore, senate literally means "board of old men" and translates as "Council of Elders". The prehistoric Indo-Europeans who settled Rome in the centuries before the legendary founding of Rome in 753 BC were structured into tribal communities. These tribal communities often included an aristocratic board of tribal elders, who were vested with supreme authority over their tribe. The early tribes that had settled along the banks of the Tiber eventually aggregated into a loose confederation, and later formed an alliance for protection against invaders. The executive magistrates of the Roman Kingdom were elected officials of the ancient Roman Kingdom. During the period of the Roman Kingdom, the Roman King was the principal executive magistrate. His power, in practice, was absolute. He was the chief executive, chief priest, chief lawgiver, chief judge, and the sole commander-in-chief of the army. He had the sole power to select his own assistants, and to grant them their powers. Unlike most other ancient monarchs, his powers rested on law and legal precedent, through a type of statutory authorization known as "Imperium". He could only receive these powers through the political process of a democratic election, and could theoretically be removed from office. As such, he could not pass his powers to an heir upon his death, and he typically received no divine honors or recognitions. 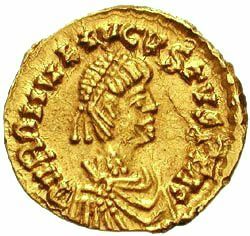 When the king died, his power reverted to the Roman Senate, which then chose an Interrex to facilitate the election of a new king. 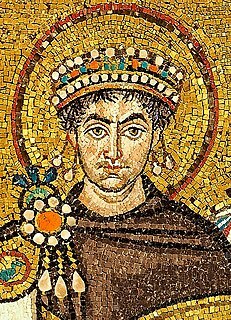 The new king was then formally elected by the People of Rome, and, upon the acquiescence of the Roman Senate, he was granted his Imperium by the people through the popular assembly. A senatus consultum is a text emanating from the senate in Ancient Rome. It is used in the modern phrase senatus consultum ultimum. ↑ Bronwen, 3. "For since the Senate has failed, the people have perished, and the sufferings and groans of the few who remain are multiplied each day. Rome, now empty, is burning!" Lintott, Andrew (1999). The Constitution of the Roman Republic. Oxford University Press ( ISBN 0-19-926108-3). Taylor, Lily Ross (1966). Roman Voting Assemblies: From the Hannibalic War to the Dictatorship of Caesar. The University of Michigan Press ( ISBN 0-472-08125-X). Schnurer, Gustov (1956). Church And Culture in the Middle Ages 350–814. Kessinger Publishing ( ISBN 978-1-4254-2322-3). Wikisource has the text of the 1911 Encyclopædia Britannica article Senate .